The tiny town wanted the Tollway to run through it. Ah, well. They’ve still got Bobcats and corn. When I venture beyond city lines, I put on country music. I don’t like country music, but it suits the milieu, makes me feel transported, American, historic. With the first sighting of corn, somewhere north of Plano, I switch from KERA 90.1 to KSCS 96.3. Martina McBride. “Like a Broken Winged Dove.” After one verse, I forget where I live. I see pie and gingham. I am ready for Celina. There is a lot of corn in Celina. There is wheat, too, and sorghum. But this year, extra corn. You start to notice it a little bit before the road ends, when you have to exit. The Dallas North Tollway, you see, gets you only part of the way to this remote and rural place, tucked in west of Preston Road, like a bandana in a back pocket. It smacks of a 1970s Coke commercial here, with those slim streets and lone pickups. I feel like I am in a pickup, but I am in a Prius. I get lost in my Prius and have to phone up City Hall, blasted, all of a sudden, into 2010. I turn off Martina McBride. “There is a sign that says, ‘No Outlet,’” I tell the person who answers, flashing on Mikasa tableware and DKNY. “You’re going to have to reel me in.” If the Tollway didn’t stop 6 miles south of FM 428, I realize, the exploration of which fact occasioned my trek in early July, I would have found my way without incident. Well, maybe. Jason Gray injected Celina into the public consciousness in June, proposing with a couple of other town officials a fresh and inventive move to entice the North Texas Tollway Authority to build its planned extension through their town, 42 miles north of Dallas. They offered the NTTA cash—about $96 million of it—in the form of property taxes on future businesses that would locate along the new 11-mile stretch of highway. “It’s clear the growth is coming this way. We can choose to love it or hate it, but it’s coming,” Gray says. Turns out, Celina will love it or hate it only half as much. A few days after my visit, the NTTA voted to run its extension in a different direction, a path that traces the Collin-Denton county line several miles west, giving an economic boost to Celina on one side and to the equally teensy Pilot Point on the other. For Celina, a generationally and racially diverse population of 5,500, the loss, though only partial, is personal, too. Back in 2000, it seems that Pilot Point (which is more than 6 miles from the Tollway) illegally annexed the portion of land along the road, with the suspected intention of one day winning the kind of vote it just did, according to Gray. Celina sued, but filed too late, and lost. For now, though, this imaginary ribbon of pavement is providing nothing more than political chatter, since construction won’t begin for at least 10 years. So, to me, a visitor to this almost untouched agrarian vista, there are more pressing things. For example, there are sports. Sports are big in Celina. Really big. On a curve off Pecan Street, I find it necessary to stop. I am in Bobcat Country. Bobcats are athletes who go to Celina’s high school and dominate all the sports they play, particularly football. It is a Monday afternoon when I stand at the stadium fence, walloped by orange emblems, orange signs, orange pictures of the big orange feline, but, in my brain, it could have been Friday night. I see lights, packed bleachers, bands. About 97 signs list all records held: 68 wins in a row (a state record), eight state 3A football championships, seven in track and field, and one in baseball. With just 552 kids enrolled, the school makes use of its talent. Small shingle houses and narrow streets border the stadium. Yards are filled with the accouterments of work, lawn mowers, tools, rakes. Parking is tight for games. A few short blocks away, the railroad track marks the entrance to the historic downtown square, 100 years old and now a bit dusty. Jimbo’s Pizza commands one end, and the Jim G. Bray Law Office, another. Gold letters on the window read “LAW OFFICE” in arched Western capitals. I trace the route of the annual Kick-Off Parade. A few years ago, more of the square’s businesses were doing better than they are today. 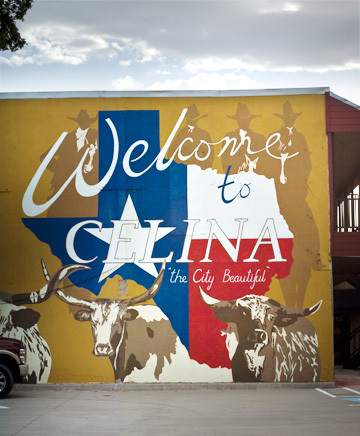 The rest of Celina’s 70 square miles are lush and green, maintained as cropland or horse farms. But wait. Before you think, “Yawn, just another field with horses on it,” do not think it. No person should leave North Texas, let alone planet Earth, before seeing what goes on at Lazy N Farms. What goes on is fantastical, remarkable, and absolutely the most adorable endeavor a human person could witness and fall in love with, even if he didn’t want to. Lazy N Farms raises eensy-weensy horses, miniature horses, infinitesimal microscopic baby horses that you could put in the basket on the front of your bicycle. Okay, in your passenger seat. Your wheelbarrow. Wherever. But somewhere, because they are like no other creature in our galaxy. I continue my tour of Celina, which was established in 1876, by the way, hitting the Big Orange Pumpkin Farm and another horse situation of distinction, Punk Carter Cutting Horses. Carter, a recognized afficionado, trains and sells the kind of horses that separate single cows from their herds. These are quite the clever animals, though not nearly as cute as the itsy-bitsy wee ones with the swoopy eyelashes and dainty dancer feet and pocket-size bodies that can fit in your lap. But Punk Carter makes his own barbecue sauce. In Celina, Texas, I learn, if you don’t raise miraculous horses and live on a ranch or near downtown, you have a newish house in a development on former farmland. These are mostly east of Preston Road, near the road that takes you south to Frisco, Plano, or McKinney, where about 65 percent of the city’s residents work. I would probably want to become an equestrian if I lived in Celina, I think, beginning my drive back to Dallas. I would want to stay put in Celina and get a saddle. It is a fine thing, I decide, that the big, fast, modern highway won’t come charging through this sleepy place after all. City Manager Gray said that a lot of folks didn’t really love the idea anyway. “We are thrilled that it’s going west,” Nigh says. The proposed extension would have sat 400 feet from his house. In 1902, the Frisco railroad came into the area, but it ran pretty far from Celina’s downtown, which boasted a general store, mill, and drugstore. To be closer to the tracks, the people lifted their houses and businesses on rollers and moved them west, industrious folks that they were. In a decade, the “railroad” will come again, like a belt that you can expand when you eat too much. This time, the distance should feel just right. I switch on 96.3. Carrie Underwood. “I Ain’t in Checotah Anymore.” The symbolism is not lost on me. When I hit 380, I make the correct turn west to the Tollway, and then south for home. The corn sways in a hot breeze. A horse flaps its tail. A Jack in the Box restaurant springs up behind his barn. I flip the radio to KERA.